Presenting the works of 9 outstanding artists from different countries including Brazil, Lebanon, France, the Netherlands and the UK, we are invited to explore painting, one of the most favored and exhibited art forms over the years. Experimenting with various methods, surfaces, themes and styles of producing artworks, these artists emphasize the importance of painting and together offer a window into its evolution, acknowledging its place within contemporary art. Amy Polling tells different stories through her bright and bold artworks. She has always been intrigued by feelings, and she enjoys observing people in order to see beyond their appearance. She sees the pain, sadness, passion or joy in their eyes and accordingly, she lets her brush and colours take over to tell a story of it's own. The pieces of work exhibited by Haroon Khwaja_Art in this show are based upon letting go of feelings and control, thereafter letting a natural process develop upon the canvas which is then presented in a conceptual abstract form. His work is created over a period of time where initially he creates a visual that is based upon how he feels. Thereafter a variety of mediums and techniques are applied. This part of the process is where he lets go not only of the controlled aspect of painting but also how he feels. His method is all about letting go and letting the process of time be in control. Sylvia Barrero;s works are created to convey the essence of nature. She relies on our desires for beauty and balance which is what she intends to reflect in each piece through the use of color, texture and harmony. She begins her work by applying colour layers fluently, letting each image emerge and then focus on details that will make it look alive. She thinks of her work as a pause from our busy lives, engaging the viewer by creating an inner sense of order which can shift its emotional state. With this talented group of artists, the exhibition will bring together a schematic band of cultures to present the diversity of painting being created today. 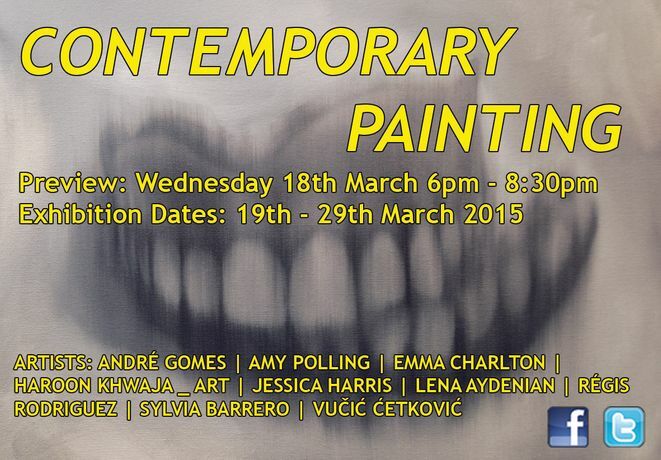 We invite you to join us for a drink at the opening night of CONTEMPORARY PAINTING at The Brick Lane Gallery open from 6pm-8.30pm on Wednesday 18th March 2015.